Its central location makes it the ideal stay for a city break in the capital, while its close proximity to Earl's Court makes attending concerts and events easy. After a day of sightseeing, cap off the night with a cocktail back at the hotel's lounge bar. Whether you're reason for visiting is for business or leisure, you're every need will be taken care of. 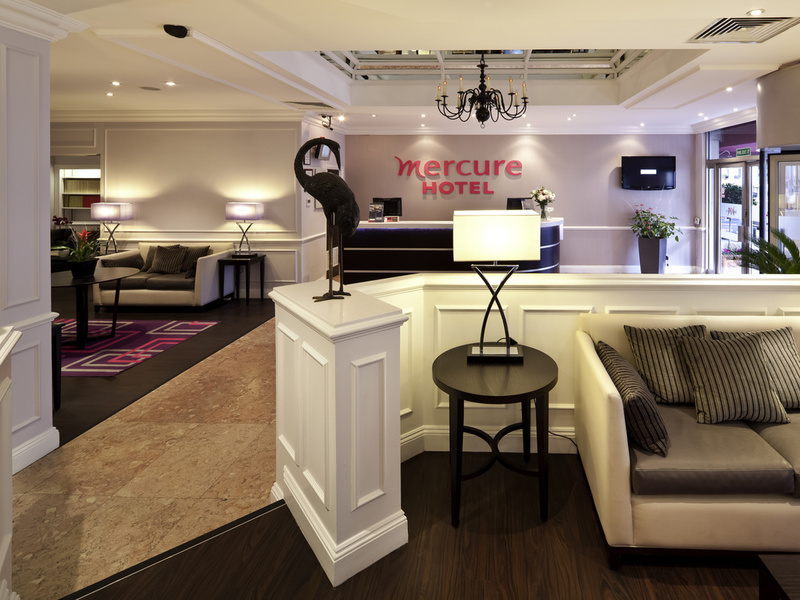 From comfortable bedrooms to a dedicated meeting facility for up to 20 guests, Mercure hotels have you covered. All rooms have contemporary décor and are fully equipped with modern amenities, including LCD TV, Wi-Fi and a smartphone with free international calls and internet. Privilege rooms offer complimentary soft drinks and a Nespresso coffee machine. A good stay with everything provided as required. Polite, helpful staff and altogether we enjoyed our 2 nights in a well-appointed comfortable room. The bathroom was a little 'tired', but apart from that no real comments. If the hotel had been fuller, the availability of the single, small lift might have become an issue especially at peak periods. We were allocated a room close to the lift which was very noisy each time it went down. We asked to be changed and the staff sorted this swiftly, quickly and effeciently. We were very happy with our stay. Overall the experience was a good one. The room was satisfactory, it met our needs and the bed was comfortable. The hotel was close to transport which made it easy to get around. We found the language skills of a few of the staff members a bit lacking. It was a bit difficult to converse with some of them. The staff weren’t the most friendly at check in - a little officious! My only other comment would be that the rooms are very small - I know when booking it mentions room size but I was still surprised. I felt the price was a little high for such a small room. It is a quaint hotel, in a great location. The bed was uncomfortable, and my room access card had to be replaced 4 times in a week. That is not good enough. The bar did not have a lot of the wines that were on the menu. I ordered room service one night, and the food was cold, I returned it and I'm pretty sure they just microwaved it. The hotel was able to accommodate an early check-in. The staff was friendly and helpful throughout my stay. The smallness of a small double room was a bit of a surprise. Very friendly staff who made us feel welcome and valued but the small double was more like a single room with a double bed in it. We were only able to get from 1 side of the bed to the other by shuffling sideways along the bottom of the bed. The bed itself was not very comfortable though the pillows were. Quite a good breakfast though the milk on the table was turning sour. The fried eggs did not much resemble fried eggs and the yolk was hard. The sausages and mushrooms were nice. The coffee was a bit insipid. Location, Staff and food were great. Room was poor despite upgrade. The tv would only work after disconnecting from wall. Bathroom door didn’t close - too big for opening. A/C wouldn’t work on chill mode and bathroom in mid refurb. Everything fine apart from the room was too hot for me, the window could not be opened, presumably due to the traffic noise outside, the air con was no more than slightly cool air and even with it on all night the room stayed warm, for me, throughout the night. It was ok but my room wasnt serviced, had to call to request an invoice that Id asked for at check in and catering staff slow and unattentive in both breakfast and bar. In essence, my stay was short and largely uneventful. Check-in fairly straight forward. I had to ask for directions to my room as they weren't given during the check-in process, but otherwise no issues. Breakfast was a bit of a let down, the cooked breakfast items all tasted extremely cheap. What seemed like zero attempt to make a quality experience with the quality of the sausages or preventing the eggs from being so overcooked they were like rubber (I attended breakfast within 30mins of opening, so items should still be really fresh). I requested a cappuccino and was informed that it would cost extra.. fair enough, but the house coffee tasted terrible. The Mercure in Amsterdam doesn't charge any extra for cappuccinos with breakfast and you can have as many as you like, so I was a bit disappointed there. If I had known the breakfast would be that sub-standard I would've not included it in my booking and instead got a takeout from a vendor nearby, of which there are loads to choose from in that part of Kensington. Great stay. Staff were brilliant. Would come back again. Nice, clean and affordable hotel. Was good, excellent breakfast, nice location. Just too noisy the cleaning service at early morning.